1 of 5 Heat oven to 400 degrees F. Coat just the bottoms of 12 standard-size muffin cups or line with muffin-cup liners. 2 of 5 In large bowl, whisk together flour, baking powder, and salt. 3 of 5 In medium-size bowl, whisk eggs, milk, juice, sugar, oil and zest; stir in 1/2 cup of the chips. Make a well in flour mixture; pour in egg mixture. Stir until dry ingredients are just moistened. 4 of 5 Spoon 1/4 cup batter into each muffin cup. Sprinkle remaining chips on top. Bake in a 400 degree oven for 20 minutes or until toothpick comes out clean. 5 of 5 Remove pans to wire rack to cool 5 minutes. 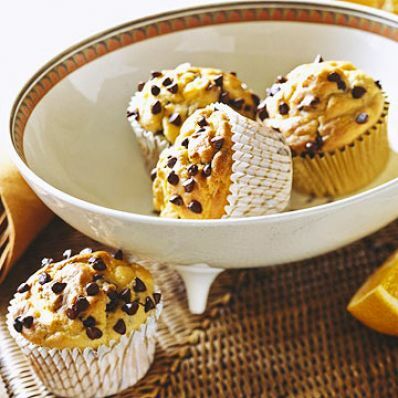 Remove muffins from pan; cool completely on wire rack. Makes 12 standard muffins.